Dance shoes are probably the most important garment for the dancer. Good dancing shoes are characterized by quality materials and above all, for its sound. In the market there are numerous materials for flamenco shoes. For a good quality shoe we advise that the shoe is a Spanish product and that it should made out of suede or natural leather. Many stores sell imported shoes from Asia and the quality of this shoe does not meet the minimum requirements. Today, we can have a shoe made out of genuine leather and of Spanish production from 26.95 € so you can get good quality for your feet, at a very affordable price so you don’t have to to opt for plastic shoes, which would cause excessive sweating in the feet and quite possibly chafing wounds. 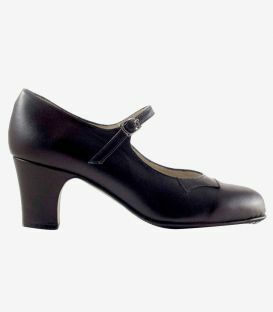 Remarkably, not being experts in the Flamenco dance, Asian manufacturers do not offer shoes with good sound, which is the most essential quality of a good flamenco shoe. For Flamenco shoes the material possibilities are varied but the choice of one or the other is governed by the type of feet and the amount of time that they will be used for. Skin: material durability and strength. This material is perfect for a dancer rehearsing for many hours a day. If the material undergoes a scratch, you can simply apply a little black colored cream to cover up the imperfection and your shoes will look like new. Suede: Especially for people with wider or sensitive feet. This material adapts faster to the feet it’s characterized fir its extreme softness. Highly recommended for dancers rehearsing many hours without rest. Patent Leather: This material is composed of two layers. The bottom layer of skin is present in good quality shoes and the top has a very bright plasticized effect. This option is ideal for shoes for shows as they are visibly very appealing and attractive. We recommend this material for shoes for very moderate use or for specific occasions as its strength and durability are much lower than regular skin. Crocodiles and Snakes: These skins are called “skin's fantasy." They are skins printed on a layer to create the texture of a variety of animals such as crocodiles, alligators or snakes. Skins and textures are of very bright colors and are ideal for the stage as they are more unique and unusual shoes. Because of its lower durability compared to leather or suede, we recommend this type of skin for moderate use shoes. - Fastening with a belt: It is the most classic method and still many dancers prefer it to other more modern methods. It offers good support and durability. It is highly recommended for people with fine or thin feet because by having holes at different heights, it can be adjusted to the needed measure. - Fastening with two cross straps: It was the second method after the classic tying with a belt method. It is usually composed of a fixed elastic strap and another one that is leather and which is attached by positioning it in the buckle with the desired gap measure. This method is not recommended for people with very wide feet or high instep because they may feel the tightness of the elastic over the bridge and the elastic strap is not adjustable. - Fastening with two straps: Based on the same method of a belt but there is a second one added, more for aesthetic reasons than for fastening objectives. - Fastening with laces: It is the most modern method for fastening flamenco shoes and it’s the most fashionable one nowadays. The laces are as good a choice as any other despite the popular belief of novice dancers that the laces slip and untie, this method is as reliable as any other and if its well tied the knot will not untie. The laces of these shoes are not ordinary strings. They are designed and manufactured with the intention of having a good durability and grip. If, after many years, your shoelaces are a bit worn out, you can buy a new pair of special dance shoelaces for only 3 € in a wide variety of colors. - Fastening with Ribbons: This method consist in surrounding the ankles and the end of the legs with long ribbons that end up in a pretty bow. Aesthetically is beautiful and very elegant but it is not recommended for regular training because it is not the most comfortable tying method and it takes up much more time than any other tying method. If you decide to choose this method, the ribbons should always be in suede leather because of its extreme softness in order to guarantee skin care and avoid undesirable scratches that regular leather ribbons or patent ribbons may cause. Another option that the flamenco shoe market offers nowadays are the heels. Choosing the right height is crucial to feeling comfortable and safe with your new flamenco shoes. 6cm heel: This is the standard and most used heel. 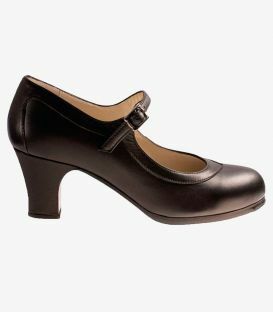 In the range of semiprofessional shoes, it is common that this option is the only one available as it is the best-selling heel. 5 cm heel: it is usually called "low heel". Due to the heel’s low height, 5 cm heels are more stable and are highly suitable for both older people (which are given to be the first ones to get tired feet) and for people who have less balance. 7 cm heel: Usually called "high-heel". Tamara Flamenco always advises not to use the 7 cm heel. There are only a few dancers who choose it but when they do, it is often for aesthetic reasons. 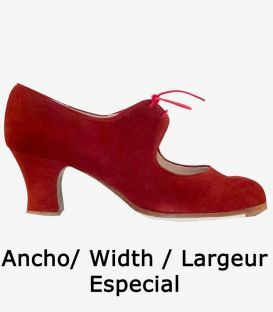 The experts of TAMARA will always recommend you a low or normal heel as the aesthetic difference is minimal and yet this height is much more painful for the soles of the feet, joints and tendons of the ankle while producing a much faster and more intense exhaustion in a flamenco dancer due to the greater inclination caused by the height of this heel. 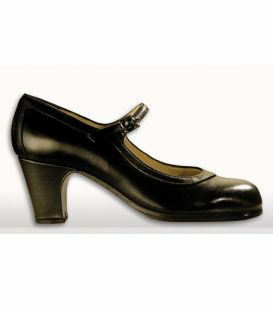 The Flamenco semiprofessional shoe is the footwear that the beginners in Flamenco dance opt for. .These Flamenco shoes are cheaper than the artisanal or professional ones, but they remain within the semi-professional range. They also vary in material and quality. How can we recognize a semi-professional quality shoe? As this is the most common question our clients make, we leave a summary of the characteristics and qualities that should have a semi-professional quality shoe. 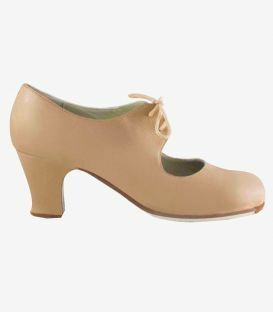 Origin: In TAMARA Flamenco we never work with footwear of an Asian origin and we do not advise anyone to consume dance shoes with this origin due to the poor quality of materials and incorrect assembly and production that cause the product to deteriorate quickly and makes the heels break or peel off easily. In TAMARA, we consider that the best quality seal that a Flamenco shoe can have is the "Made in Spain” seal. No one will manufacture a Flamenco shoe, product originating in our land, with the same quality and professionalism of a shop or factory in Spain. Materials: The most recommended materials will always be cowhide or suede. It is certain that plastic, fabric or imitation buckskin are completely disregarded, which in the short term will cause wounds, chafing and excessive sweating of the feet. Material quality: the softer and flexible the suede or leather, the better the quality of the leather and it will be easier to mold. 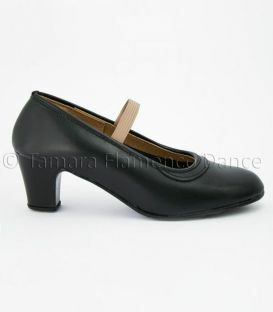 TAMARA Flamenco advises to disregard shoes with leather that is too rigid or harsh because they are difficult to mold. Inner pad: If it has an interior pad, this will make the shoe more convenient and comfortable for the feet because it will cushion the foot against the ground. It is important that the pad is made out of leather with a proper foot perspiration. The heel: A wooden heel, will have a better sound than a plastic one. 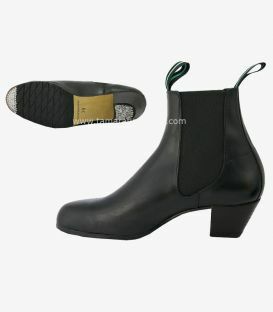 This quality is also very important if we want a good sound in our flamenco shoe. The fastening method: A strap will always be better that an elastic. The economic difference is small and the belt keeps in place the grip of the instep in order to avoid our foot to separate itself from the dancing shoe. It is very important that the strap is made of leather or suede to avoid cuts or wounds that may eventually may be caused by a plastic strap. In our section of flamenco shoes for men you will find a wide range of men's Flamenco footwear including: Blucher, riding boots, shoes, and Flamenco ankle books for gentleman. 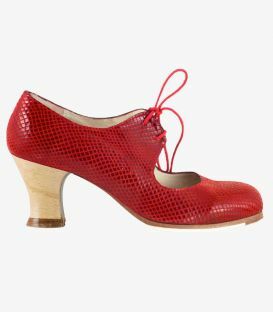 In this section you will find both professional Flamenco dance shoes for men and semiprofessional or for rehearsal, perfect for any occasion and adapted to the needs of each dancer. All of our Flamenco shoes for men are made with high quality materials such as natural cowhides, suede, patent leather, snake and crocodile skins. Each of our models of Flamenco shoes for men (both Begoña Cervera as TAMARA brand) are designed and manufactured 100% in Spain which is a secure seal of quality. In this section of our website you will find all the designs, sizes and colors of the professional shoes that are in stock in our warehouse. To select a shoe in this section has advantages as it avoids the usual 45-60 days that are needed to manufacture a shoe and you can receive a new pair of Flamenco shoes at home in 24/48 working hours and free shipping included ! ( Only available in the Iberian peninsula). To see our stock is easy. You can go to the column on the left and pick your size to see what we have at the moment in our store for you, or if you want a particular model, you can go to product and see the updated stock in the chart under the photo. In the table we specify everything about the shoe from the type of heel to the type of material or the width that the shoe has, which will let you know at all times what you are buying. Does the order arrive to your home and something about your new shoe doesn’t convince you? That’s ok! Everything you choose from our warehouse can be replaced. If you do not like the one you've received, replace the one you like with another one or order one entirely to your liking. IN THIS SECTION YOU CAN CUSTOMIZE YOUR BEGOÑA CERVERA FLAMENCO SHOES. If you prefer to see our large in stock shoes, just use the left filter or clic here: "In stock Begoña Cervera Flamenco shoes"
We are the official distributors of Begoña Cervera and therefore we offer a guaranteed minimum price. Professional brand shoes Begoña Cervera comes from its founder's passion for the Flamenco dance, design and fashion. Almost at the beginning of the company, the founder of Tamara Flamenco and Begoña Cervera met. Realizing that they share the same ideals, they begin to work together and today we are proud to say that after a long journey of 15 years, the Begoña shoes continue focusing mainly on strengthening the values ​​that have always characterized TAMARA Flamenco: Craftsmanship, quality and the "Made in Spain” quality seal. The Begoña Cervera brand always remains a part of the most important fashion events and Flamenco. Each year new footwear styles are designed to suit all the requests and needs of our dancers. Annually they surpass themselves providing innovation in the Flamenco footwear which turns it more and more into a piece of design and craftsmanship, the latest one, in 2014 they introduced to the world the painted flamenco heel, wooden heels custom made by a group of painters that reflected on the heels, famous paintings recognized within the world of art. This great, innovative and creative idea was so popular that the brand continues to create new heel designs each year based on the ideas and suggestions of professionals and dancers using the brand. 1st Sole: The first sole is divided into two parts. The half that is in contact with the ground is white and is made of a material called spay. Specially designed to grip the floor well and avoid slipping. The other half corresponds to the part of the bridge, it is hard leather and sewn by hand. This gives a great boost to the bridge and the heel. 2nd sole: It is brown (although sometimes it is painted black), it’s an intermediate layer that helps cushion the impact of the strike on the joints when we're dancing. Inner suede pad: It is extremely soft and is made out of suede, in order to avoid excessive foot sweating with the heat and it absorbs sweat better than any other pad. This cushioned insole is designed with various reliefs in order to adapt perfectly to the dancer’s foot. The professional shoe range should have more nails for a stronger and cleaner sound with a better formation and a perfect filling. Because of the professional shoe’s perfect finish, they make less damage to the floorboard and wooden floors. The most professional Flamenco shoes are always handmade and 100% Spanish. Only the extensive experience of our shoemakers ensures durability, quality and an incomparable sound. Models: The Begoña Cervera trade has up to 75 different designs for you to be able to be yourself, you can always find the perfect model for you. Material: A professional shoe should always be made of leather and above all it should have great quality (usually cowhide). This ensures the strength and durability that characterizes the professional range. Currently Begoña Cervera offers other than the usual suede and leather, more exclusive skins such as snake, crocodile, alligator or leopard skins as well as patent leather in attractive colors (although we suggest that the latter two ranges, fantasy skins and patent leather, should have a more limited use or that they should be used for the stage because the surface layer of these skins is more delicate). Additionally, if you choose a shoe with different parts, do not miss the opportunity offered by Begoña Cervera, to combine different colors and materials in the same shoe. Another option that Begoña Cervera offers is to embroider your shoe with polka dots, with already created flower patterns or with your name on the sides of your shoes to make them even more custom made. With Begoña Cervera, the limit is your imagination. Colors: The professional shoes have a wide variety of colors, almost as much as you can imagine because its craftsmanship will suit your needs. If you do not find your color in the color chart write to us and we will search for it ;). Fastening your shoe: Having such a wide variety of models, the customer can choose any required fastening: strap, double strap, triple strap, laces, velcro, ankle ribbons or elastic. All are functional and the fastening method chosen will depend on the preferences of each person. Sizes: From number 32 to 43.5. A professional shoe should fit your feet perfectly therefore the Begoña Cervera shoes come in half sizes and with a difference of only 3 to 4 millimeters per size. Remember that, if all these features aren’t met, a shoe can never be 100% professional. 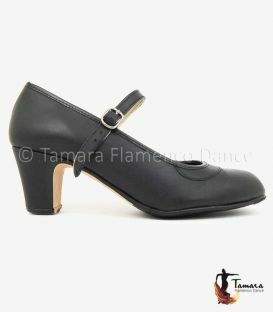 Important: TAMARA Flamenco is an official Begoña Cervera distributor and therefore we offer a guaranteed minimum price. If you find it cheaper elsewhere, we will refund the difference ;).